Ferns are an extremely varied and versatile group of plants. Along with algae and moss, they represent prehistoric plant life that has adapted to our modern world. While there are many, many kinds of ferns with varying cultural requirements, they are usually categorized as tender or tropical ferns as opposed to hardy or native ferns. 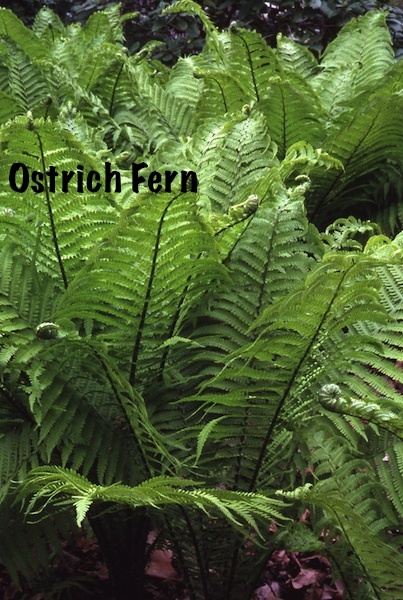 Hardy ferns are those species that are able to grow year round outdoors in temperate regions. They are real assets in the residential landscape, as elements of a perennial garden or in other areas as groundcovers. They provide soft texture, lush foliage and a sense of movement to a landscape. There is a fern for just about every site in a garden. They range from 3 or 4 inch tall groundcovers such as Rusty Woodsia and Walking fern to 4 to 6 feet tall such as Cinnamon fern or Ostrich fern. Most ferns fall somewhere in between these extremes, growing in clumps that are 2 or 3 feet tall and 1 to 2 feet wide. Ferns do not have typical flowers. They have a more primitive way of reproducing by means of spores which develop in cases under the leaves and are released into the air. They settle to earth and, under the right conditions, form a small, flat structure that supports the development of male and female organs. It is these organs which foster fertilization, thus the creation of new fern plants. Fern leaves grow in 2 rows along fronds, or stiff branch-like stems, as small leaflets. The fronds emerge in a unique manner, uncurling from the center of the plant clump as tight fiddleheads which open up as they rise and mature. The leaves become visible as the fronds expand. They may be bright green, gray-green or even silvery and reddish, depending on the fern species. Some fern foliage remains evergreen year round and some is deciduous, turning gold, then brown and dying back in the fall.